Lol, these are not my words, but those of a leading national newspaper. A few months ago, it would have been mighty hard to find "Trivandrum" and "hub" in the same sentence in any media report. Today, as Brahmos Aerospace brings the defense and aerospace industry to Trivandrum in a major way, the perception is changing. Brahmos will only be the second plant of its kind in India and one of the most advanced in the world, as it will manufacture what is possibly the most advanced cruise missile in the world. Brahmos will target a turn-over of over Rs 1000 Crores in five years' time, as export orders will add to that of the Indian Armed Forces. In addition, the tri-services Aerospace Command is all set to come up at the Southern Air Command. The Coast Guard station at Vizhinjam is being expanded and the Army has submitted a proposal to the Government for an Army Medical College in Trivandrum. Satyam Computer Services, one of the top 5 Indian IT firms, has submitted a proposal to start a campus in Trivandrum. It has asked for 30 acres of land from GoK. Perhaps due to the "Take Deviation" experience encountered by other IT firms looking to set up shop in Trivandrum, a senior Satyam official said " Satyam will enter the state if we get the space here. We are not interested in setting up it anywhere else in the state." Now, all that's required is for the Government to reply positively and the State will have gained an IT major and maybe up to 10,000 jobs. Whereas Brahmos is a great gift to the city for the coming year, there is a long list of others which could be in the pipeline. Last year, we had looked at a list of projects. In the days ahead, I will look back at how many have made any progress. I am guessing it won't be a pretty picture but we have better times to look forward to if the closing weeks of 2007 are any indication. Wish you all a very Happy and Prosperous New Year in advance. I hope many of you are in Trivandrum today to enjoy the most happening New Year Party in Kerala as the city goes wild and lights up the night! Cheerio! See you all next year, folks! "Freakonomics" is a truely thought-provoking book by economist Steven Levitt and Stephen Dubner , which has become somewhat of a cult classic among those who prefer to think off the beaten path and try to understand the often surprising drivers underlying mundane looking facts of our world. In it the authors outline a very familiar but often over-looked reason why we sensationalise some things and ignore others, it is called, well, the "principle of familiarity". The best example is the fear of flying. We don't bat an eyelid when we set off on a drive along roads which are populated by maniacs, and strewn with the wreckage of accidents. But when someone near and dear is setting off on a flight, there is always a hue and cry, despite the fact that airline pilots are seldom maniacs and that India has not had a civilian airline accident in at least a decade. (touch wood!) In fact, statistics show that airline travel is at least as safe as or more so than automobiles. If we take gross accident and casuality figures, air travel is much safer than driving your car. So, shouldn't we be feeling safer taking that flight rather than when we go grocery shopping? According to Levitt and Dubner, it is because cars are familiar and under our personal control, that we feel safer in them. They are familiar! So it doesn't matter that the pilot on your next flight has 5000 hours of experience and his plane is packed with millions of dollars of safety features, while your driver (maybe a younger sibling) has just peeled off the big, red "L" board from your car, which was its only safety feature in the first place! You still feel helluva lot safer in the car. This is why we believe in horoscopes and quack astrologers, in curses and wishes...and yes, in touching wood, among other things. Peter Sandman, a self-described "risk communication consultant" (he essential advises you on how best to tell your dad that you crashed his car) has a nice equation for what he calls the perception of risk. So the perception of risk is a combination of the actual, often quantifiable element of danger (say, the no. of air fatalities per million seat kilometers of travel) and the perception of that danger itself (the gruesome vision of an air crash). According to Sandman, when hazard is high and outrage is low, people tend to underreact and when the hazard is low and the outrage is high, they tend to overreact. This explains why the local Greens are up in arms when one tree is axed for road widening eventhough hundreds are being cut down daily in illegal logging operations across the State and the Country, or why there is an uproar when the Government hands over some quasi-forested land to ISRO for a world-class institute even when hundreds of acres of dense forest are being appropriated for ganja cultivation. The operative phrase is "out of sight, out of mind". Visualising a tree being cut down at Kowdiar Avenue is much easier than doing the same in some obscure, inaccessible jungle. Not to mention that protesters can conveniently reach Kowdiar from their air-conditioned houses, in their fuel guzzling cars whereas the forests of Idukki or Bandipur are a tad farther away. Now, while this just described phenomenon can be seen in societies across the world, there is a parallel but opposite process in action as well, the manifestation of which is evident in our media day in and day out. Let's take the tale of two projects. One is an established player, the largest of its kind in India. It has attracted investors and praise in equal measure from across the world, big and small. It is rapidly expanding with a proven business model and a large existing and potential clientele. The second is a marginal player based in a country where its chosen industry is non existent, it is about one-third the size of the above mentioned player, has no major operations to speak of and is still to evolve a firm business plan or schedule of expansion. Thus far, I am sure all of us would agree that the odds are firmly in favour of the former. People would be more interested in it because of its proven track record and scale. The media should be continually reporting about it, especially since it is the largest employer in the region. As for the second player, a wait-and-watch approach would be adopted. Right? Well, wake up and read the news. Atleast, read or listen to a few members of the local media fraternity. Surprise, surprise....the second entity gets ten times as much media coverage and even more of the share of public interest. Illogical, well that's the truth and you and me are all part of this willing suspension of logic. Many of you would have already understood what I am referring to. The first mentioned is Technopark, India's largest IT Park and Kerala's largest employer. The other is the Dubai Internet City, the darling of the press. Source: Media reports, Technopark website and press conferences by GoK/DIC. 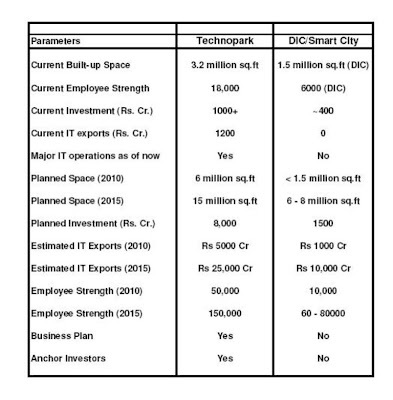 Note: Technopark refers to Phases I-IV. Think about it, despite the entire affair having dragged on for almost 3.5 years and a formal agreement having been signed for the last 8 months, DIC still does not have a business plan. Leaves one wondering whether they were expecting manna and money to fall from the heavens. And even if the smallest builder is launching a modest apartment project, care is taken to have snazzy imagery available. Despite the fanfare of the project inauguration of the "Smart"City project, there is still not even a single pixel available. Maybe the ink ran out?! Much is also harped up on the fact that a sister "Smart" City project is coming up in Malta. It is a modest 1 million sq.ft commercial development according to the official site , situated on a tiny island (about the size of TRIDA) with a population of about 400,000. That the island is in the middle of the Mediterranean Sea, has no local IT talent pool and hence is one of the most unlikely places to put an IT park (along with Greenland, New Guinea and the Falkland Islands) seems to have found little mention in the press. Atleast for the Malta projects, there are a few renderings available in the press kit . The one in Cochin has not even been deemed worthy of even a couple of artists' impressions. So, if this is the case, why is this project occupying centre-stage instead of others which are far more believable and which bring greater benefit to the State and its people - Vizhinjam, Cochin LNG Terminal, Technocity and so on to name a few? The answer is found in the value of the third variable in that equation (Attention = Substance + Hype). A media frenzy over the past few years and months has resulted in the topic occupying far more mind space than it ever deserved. A frenzy which was primarily the doing of a Kottayam-based newspaper and the oldest of malayalam channels. One knows not for what reason, but more space and time were devoted to this issue than to more urgent ones like the pathetic condition of the State economy or to bigger projects like Vizhinjam, Technocity or the LNG Terminal. This is where the question of novelty - the opposite of familiarity - comes in. Though far bigger and more successful than DIC, Technopark was a familiar entity. Whereas with the right mix of "Dubai", "Smart", "Microsoft", "IBM" and what not, there was a lot of novelty on DIC's side. And the people were hooked! They can't be blamed, not when they are treated to claims that the so-called "Smart" City would help Kerala overtake the likes of Bangalore and Chennai as an IT hot-spot, whereas in reality the total amount of space (and hence employment & revenues) to be added by DIC in 10-12 years is only as much as that added every year in Bangalore or Chennai. Or when the public is told that DIC already has the likes of IBM and Microsoft as tenants in Dubai and will bring them over to Kerala, when the truth is that only sales offices and service management centres work in DIC - no major IT firm has software development centres inside DIC. The reason is very simple, the manpower will have to be brought from India and paid much more, contrary to the principles of offshoring. Sadly, only those working in the industry are aware of these facts, whereas everyone else seems to be on the trip of their lives. Including the Govt. of Kerala. Well Ministers and Bureaucrats read papers too, can they be blamed for being led astray. One of the top IAS officers of the State, whom I was meeting for another purpose, asked me if DIC were going to construct all the buildings themselves?! I was incredulous, finding it hard to believe that such a senior administrator himself knew so little about a joint sector project! But, that is the sad truth. No one seems to know much about what is going to happen, not least of all the DIC team itself, which is still searching for business plan. DIC is just a case in point. The trend applies to all sorts of things in our daily lives. We value a Mercedes Benz more than a Skoda with the same features, or a Nokia more than a Samsung. Marketing gurus call it "brand power", but it is a fancy name for the accumulated hype that has been built-up around the brand. After all, neither Benz nor Nokia started out with a head-start over its competitors. All of it was built-up steadily over time, with conscious efforts to differentiate themselves in the minds of their customers. Unlike in the case of consumer products and services, when we allow ourselves to be led the wrong way in the case of public policy and projects, the end result could be very damaging to society. For example, very little public opinion is directed in favour of developments at Technopark. I cannot recollect even a single public demonstration calling for the speeding up of projects there, despite the fact that it is and will continue to be the largest employer in Kerala. When we delight in calling hartals and bandhs for reasons ranging from the execution of a genocidal maniac called Saddam to the Indo-US Nuclear agreement, I fail to understand why the politicos and the public balk at even a dharna for a mega-project like Vizhinjam, which could change the trading map of the entire region? Or why is it that the newspapers devote space, ad nauseum, to the Dubai World container project when they scrooge over giving attention to a port project which is 4 times its size and a dozen times more important. Or why such a hue-and-cry is raised over handing 100 acres of land to India's most prestigious organisation - ISRO - while laurels are heaped for handing over 250 acres to a unproven firm which has nothing to say for itself, so much so that its "Success Stories" webpage is empty?! Ladies and gentlemen, the time has come to see through the make-believe part of things and analyse them for what they really are. Levitt and Dubner have pointed something that all of us do but seldom recognise. Failing to distinguish the Substance and the Hype surrounding an issue usually leads us to support the wrong cause or to fail in supporting the right one, at the very least. And when those causes are major public projects, from which all of us stand to benefit, we cannot afford to be led away from the right choice. Otherwise, the real projects could all go elsewhere and we would be left clutching at phantasms which may never come to and were never meant to come to their predicted fruition. It is always great to get feedback from all of you out there, because it helps me understand the pulse of the people and also identify aspects and details that I may never have though of. Prasant has identified and enumerated 22 infrastructural improvements that he feels Trivandrum urgently needs. Anish (scorpiogenus) has added his perspective to the items in the list. I think both these gentlemen have done an insightful and intuitive job which sadly seems to be difficult for our urban planners to emulate. 1.Making Airport- Kollam Road 6 or 8 lane road. 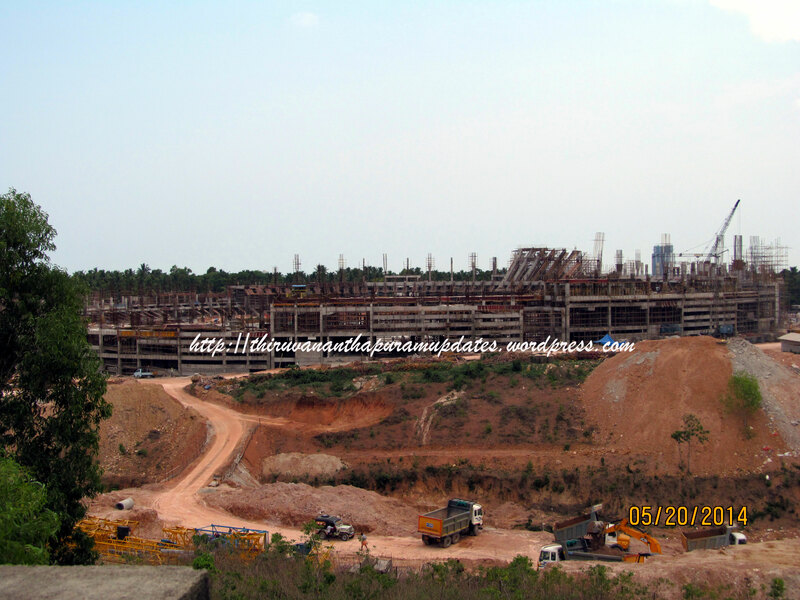 2.Construction of a Trivandrum-Thiruneveli-Tuticorin express way. 3.Ring road from Chirayinkizu to Katakada-Kaimanam (Vizinjam Stretch already exists) ( 4 lane).Conversion of Karamana-Peyad/Kattakada road to 6 lane. 5.Atleast 2 International Convention Centers. 6.More MBA schools of National/International Standards. 7.Packaged tourism (covering Trivandrum,Kollam,Nagercoil,Tirunelveli districts). 8.Setting up of a professional Urban Development Authority. 9.Increasing the role of City Corporation from mere rag pickers to development facilitators.and calling it Metro Corporation. 10.Development of Additional runways/revamping of the old/scrapped runways in international airport with runway extending into the sea. 11.Setting up of Industrial Parks in other parts of district. 12.Seeking the help from the engineering colleges(for eg. CET) in and around City for city development. 13.Improving the mass transport system(City Bus) by forming seperate authority (Like BEST or BMTC) or increasing private participation in the same. 14.Increasing the number of auto services in and around city,ensuring fair wages. 15.Development of Kazhakkuttam/Chirayinkeezhu railway station to a major station(with the name Infocity or so(so that people can easily spell and also can serve as a brand name for the place). 16.Renaming Kochuveli rly Station and Spacecity Rly Station. 17.Setting up of a space technology and aviation museum ( with the help of Southern Air Command(IAF) and VSSC). 18.Setting up of an electronic City in the suburb. 19.Laying floor tiles in all the footpaths near all roads inside the city and near technopark,so that less dust is generated. 20.Creation of more Parks and Gardens inside the city and in suburbs. 22.Creation of more Flyovers, Subways and Double Roads. If atleast five things are implemented in a time bound manner,you can see the city growing by its own. Those 22 necessities for the development of Trivandrum as a global city could just be refubrished slightly. Im suggesting slight additions or changes to Prasanth's ideas, which I think will boost the overall development. #1. Converting Bypass and the Kollam- Nagercoil highway into 6 lanes. If you dont wish to see another Hosur Road like nightmare, we must have minimum 8 lanes with dedicated bus lanes and service roads in Tvm-Attingal sector, soon to be a super Techno corridor! #2. Tirunelveli Road is a great idea. I dont know the possibilities of a rail-road corridor, but Kazhakkuttam could be developed as a junction for the Trivandrum- Punalur Railway line via Nedumangad and could be connected to Tirunelveli through Shenkottai. Regarding suggestions #15 & #17, It would eventually happen and we could develop another junction @ Nedumangad, with a new line connecting Balaramapuram and to the proposed rail link to Vizhinjam. So this railway would serve as a rail-bypass to Trivandrum Central and satellite stations of Kochuveli & Kazhakkuttam. Interestingly, it would also constitute a circular railway around the city, as in Delhi, from Kazhakkuttam-Nedumangad- Balaramapuram/Neyyatinkara- Vizhinjam. This would turn Kazhakkuttam as a hub for suburban rail and would make it Dadar of Trivandrum. #8. Regarding professional Urban Development Authority, we already have a good idea in your blog, don't we Ajay? 'Corporatising the Corporation'..in the November archive. #11. Industrial Units...very very crucial! We cant rely only on IT, we need manufacturing/ trade/service industries to mushroom in the suburbs. May be Vizhinjam Terminal can act as a catalyst, but do we have the large chunks of land?? #13. Mass Transit. Well, BRTS is the best bet, economical and viable but we need dedicated lanes for buses and of course traffic discipline so that private vehicles dont ply on them. Suburban Rail System is on the cards already. Water Transport(Kollam-Kovalam through TS Canal) is an attractive option. Metro Rail, will not be financially successful as of now, but who knows, may be in 25 yrs time when Trivandrum reaches that level. You are right Prasanth, just implement the above 5 ideas, and you will find the remaining 17 of your plans automatically becoming realities. #1. Creation of a 6/8 lane IT corridor along the Mangalapuram - Vizhinjam axis: Earlier we had been taking of a 6 lane road from Kazhakkoottam to Kovalam. But with the arrival of the Rs 6000 Crore Technocity at Mangalapuram and the even more massive deep-water port at Vizhinjam, the length and capacity of the corridor has to be expanded. With GoK and NHAI finally agreeing on the BOT model for the 4-laning of the NH-47 from Trivandrum to Cherthalai and Kanyakumari, 4-laning of the IT Corridor will happen by 2010. By then, 4-lanes will be woefully inadequate and it will be prudent for GoK to either request NHAI to 6/8 lane this stretch or add the additional lanes by itself. #2. Highway to Tirunelveli & Tuticorin: Trivandrum has always had strong trade links with the hinterland of Southern Tamilnadu. There is already a proposal for a road via Ambasamudram. With the coming of the Vizhinjam port, these areas could provide the land needed for setting up SEZs and port-based industries. #3. and #22. - Ring roads and other improvements - They are already covered under the Mobility Plan proposed for JNNURM. Hopefully, with 80% Union funding, things should happen faster than the often-still born projects of the State Government. #8. & # 9. - Setting up a professional Urban Development Authority: Totally agree to that one, as I had gone into in detail in an earlier post. # 10. - Airport Expansion: This is a trouble-some item in view of the land constraints faced by any city-based airport. Trivandrum International Airport is right in the middle of the metropolitan area, which makes for very quick and convenient commuting but which also precludes acquisition of large extents of land. A possible solution is forming in my thoughts, and I will try to put it down in my next post. # 15. - Railway expansion: Expansion of Trivandrum Central and Kochuveli stations is well underway. The suburban train service from Kollam to Neyyatinkara (till Trivandrum Central in Phase I) is already under implementation. Suggestions by Prasant and Anish to create a ring-railway will work in parallel with a ring-road system to decongest the core urban area and speed up the city's outward expansion. There is a recommendation for an elevated Light Railway System in the Mobility Plan, which can be combined with the EMU-based ring railway line. The line from Punalur can pass via Venjaramoodu and Nedumangad to meet the main line at Nemom/Balaramapuram, bypassing the congested Trivandrum Central. A line from Kazhakoottam to either Venjaramoodu or Nedumangad would close the loop in the ring line. This alignment will minimise land acquisition within the urban area, which would prove very costly and difficult. Nemom is already proposed as a Coach Care Facility and suburban terminus. Thus it could be an ideal junction. Kazhakkoottam will be the other junction and probably will handle a greater passenger load considering its proximity to Technopark, Technocity, various Kinfra industrial parks and the upcoming residential hub of the city. # 21. - Creation of a new Central Business District: Great idea! This could already be in motion along the Chackai - Kazhakkoottam stretch of the IT Corridor. With mall, IT space and hospitality projects by DLF, Plaza Centres, Unitech, Rahejas, Columbia Asia, Tamara and other international & national majors, in addition to those by regional majors coming up along this stretch, there will soon be a ultra-modern CBD coming up in parallel to the existing one. Hope to get more great feedback like this in the future too. Keep your suggestions coming and thanks in advance! India's biggest and best film event, the 12th International Film Festival of Kerala came to a wildly successful conclusion on the 14th, attended by over 9000 delegates from across the world who saw almost 250 films from all corners of the globe. The Govt. notified the remaining 250 acres of the massive Technocity project, thus clearing the way for physical acquisition of the 450 acres of land for Kerala's largest IT project, estimated to cost a whopping Rs 6,000 Crores ($ 1.5 Billion). The submission date for the Vizhinjam deep-sea port was extended to Jan 31, 2008 to accommodate requests from bidders, including top international firms, for more time to complete their feasibility studies. Nitesh Estates, a leading Bangalore-based builder, has announced a 600,000 sq.ft mall in Trivandrum, in association with a Citibank arm. This comes close on the heels of Unitech's announcement of its mall project in Trivandrum. Air India has issued the call for tenders for constructing their MRO Facility at Trivandrum, with a stipulated completion time of October/November 2008. Meanwhile, AAI has called for tenders for the construction of the Second Phase of the New International Terminal of the airport and the project is slated for completion in November 2008, along with the First Phase. AAI has preponed Phase II work in light of the tremendous traffic growth at Trivandrum. Berggruen Hotels has announced the establishment of their Hospitality institute in Trivandrum. The US hotel operator is currently building their first property in India in Trivandrum. How smart do you need to be? I recently came across a Blog Readability test on a friend's blog . Despite the fact that he was not too impressed by its result , I thought I should give it a go too. Bitter-sweet, ain't it? For all the post-grad studies and time spent in uber elite organisations, all I could churn out was somewhere in between high school and under-graduate levels. Hmmmmpppphhh! Wait a second, wasn't the idea of the blog to make for easy reading that everyone could understand so that people could appreciate the growth of Trivandrum and the issues surrounding it? So, it is a good thing that the blog got a relatively simple rating. And going further along that line of thought, maybe the blog is actually a bit too complex - if that large portion of the population which has not yet attained the Under-grad level can't make head or tail of it (La cosa maledetta è nel Latino)! So while the editorial board feels a tad belittled, it is back to the writing board to make things a little simpler. On a more serious note, I would appreciate feedback from all of you on whether the content needs to be made any simpler. Many thanks and take care! Vociferous protests have arisen against this move to close one of the most valuable resource institutions in the State and efforts are on at all levels, including that of the State Government, to reverse the decision and to preserve this venerable and valuable institution in Trivandrum. An online petition has been created to support this effort, and I request you to take a few minutes off to sign the petition. Please pass on this link to any of your friends or relatives who may want to support the cause as well. I fervently hope that the British Library will continue to be an integral part of life in Ananthapuri for a long time to come, with all our support. Thanks in advance. 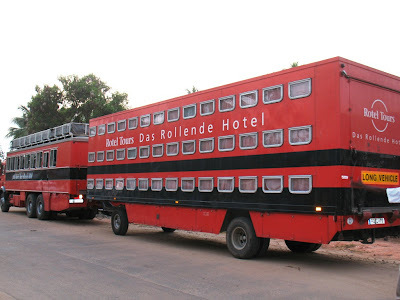 We have all heard of hotels on wheels.....on rails rather, but here is a another, even more interesting idea. Rotel is a German tour operator whose USP is the mobile hotel. And I kid you not, Rotel offers tours across various parts of the world on caravan-like vehicles which can provide accomodation for dozens of people. Rotel stands for "Rolling Hotel", by the way. One of these giants is in Trivandrum today. 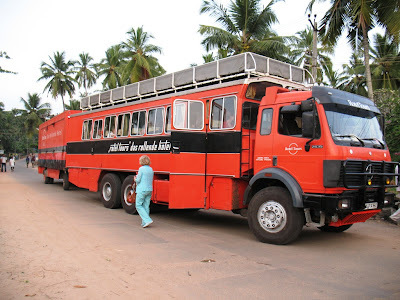 After a lengthy and hair-raising chase down the Highway, yours truely managed to catch up with the giant truck as it parked for the night close to the Uday Samudra Beach Resort at Kovalam. The Mercedes Benz truck at the front acts as a coach for the guests during the daytime when the convoy does its travelling. The trailer provides bunks for the night and other amenities. Nikunjam Builders has just announced the towering 36-floor iPark near Technopark. This giant will be one of the tallest buildings in South India. 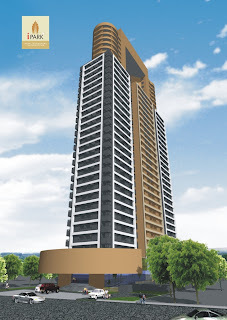 And it stands tall among the ranks of high-rises in Kerala. The area north of Kazhakkoottam is all set to become a high-rise zone as buildings of 100 m or more height are possible here according to the height restrictions due to the Airport. Technocity, which is even further away, is likely to see a plethora of high-rises, including possibly a signature tower of at least 50 floors.